From terra nullius to terra fullius, white Christians are taking over Australia, writes contributing editor-at-large Tess Lawrence. BRING BACK THE BLACK AUSTRALIA POLICY — we are being overrun by White Christians. Our black identity is near extinct. There are too many whites in Australia. The country's cultural identity is being corroded and undermined to the extent that we are no longer regarded by the rest of the world as a black nation. For too long, Australia has been an Antipodean dumping ground for white Christian criminals. In fact, in the early days of the white Christian invasion, you couldn't even get into Australia unless you had a criminal conviction. We have gone from terra nullius to terra "fullius". Slam the door shut. Enough White Christians, already. A ticket from the Old Bailey was like a passport — the equivalent of the 457 Visa and the money was just as good. Whites are not beyond enslaving people of their own skin. Such "tickets" were the forerunner of the ridiculously generous Ten Pound Pom scheme that saw waves of white, nominally Christian boat people reach our shores — many of them sunbaking on our once pristine beaches in feeble attempts to darken their skin and assimilate. But that didn't last long. In an underhand move that was designed to preserve the white race, a propaganda campaign called "Slip, Slop, Slap" was successfully mounted across the nation, imploring the white-skinned to protect themselves from the sun. It worked. White-skinned people stayed out of the sun in droves. These days, white Christians no longer bother with such pretexts and crime statistics reflect the harsh reality that they remain the largest group of criminal offenders. Look at the bank chiefs appearing before the Financial Services Royal Commission — all White and probably Christian. All the clergy who have been before the Child Abuse Royal Commission and those priests found guilty in the courts of such crimes have been White and Christian. The majority of people on welfare payments are White. Hordes of them hang about Bunnings and loiter in shopping centres, our main streets and supermarkets, pushing and shoving their way here and there as if they own the place. It is quite intimidating. They congregate at bus stops and train stations. They buy up most of the houses or sell them to off-White buyers – like the Chinese – at over-inflated prices. Because their skin is yellowish on the race colour spectrum, White Christians argue they are then more White-ish. Honorary Whites. Whites started off as a minority and now they are a majority. Statistics don't lie. Just have a look at the majority of members of our Federal Parliament. Nearly all White. No wonder they've White-trashed the place. One of the white Senators had the gall to say in his first speech (and what's wrong with using the words "maiden speech" that denote an intact hyphen?) that he wants to “reduce immigration levels and restrict entry to those who will best assimilate”. What the very White Senator Fraser Anning means is this. Restrict entry to Whites. For goodness sake, put a white sock in it. Open the floodgates and the white shoe brigade will jackboot all over us, mark my words. Anning has a White armband of history that is writ by the moral losers in this case. His beloved leader, Member for Kennedy Bob Katter, is of Lebanese descent, but hey, he's White and got even whiter hair — and guess what? Yep, he's a dinky-di Christian. Another White armband for Bob. Anning openly admits to longing for a Judeo-Christian Australia, just like the one our forebears forethought with avarice when they plonked the Christian English flag, known as the Union Jackhammer, into the sand at Botany Bay, site of the White Christian Captain James Cook's first landing on Oz. 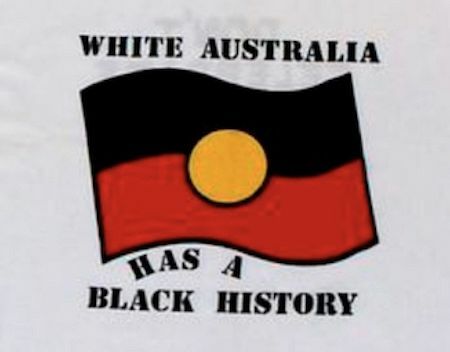 It was James, after all, who cooked the books and said that Australia was uninhabited — never mind the blacks who were standing right in front of him. Cook was a far-Right extremist who claimed Australia as a Christian caliphate for the English Monarch. And children, from that day forth, the White terrorists from the European land of Whitedom, proceeded to procreate in such vast numbers until to this day, there are millions upon millions of White people and only a comparative handful of Black people. Whites rule. They say who comes in – and who is forced out – of Australia. Their law is "sharia" in Australia. Every now and then, they tickle the Black person's hopes and dreamings — as in acknowledging them as first custodians of the land. But Black people are still the ones held in political custody; refugees in their own country. Consider the rebuff by Prime Minister Malcolm Turnbull and the Coalition Turncoats of that profoundly eloquent, well drafted and well-crafted document of Black Indigenous human rights, the dear Uluru Statement from the Heart. The hurt was like a nulla nulla to the heart. Fat chance. Not White enough.